The picture on the left is of Bill Clinton. The picture on the right is of George W. Bush. Both pictures were taken at the Korean DMZ. 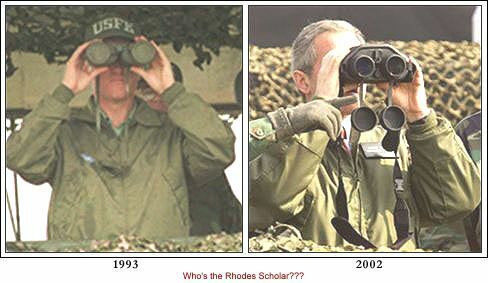 What is at issue is that one of the two didn't have enough sense to remove the lens caps from the binoculars before the photo opportunity. 4323 visit[s] to this page.